I made this card using some of my favorite products including Making Memories, American Crafts and Basic Grey. I think it is rather fitting to post a Happy B*Day card today because..
A big warm Happy 29th Birthday to my Brother, Ty. Hope your day is surrounded by friends and all the good things you enjoy in life. Know that we love you no matter how far the distance between us. Hugs from all of us here in Denver :) . Congrats on your one year! I just had mine, it is fun isn't it!? wooo hoooo for your blogoversary! Your blog is absolutely amazing! Congrats! You rock girl! Your blog is just amazing. Congratulations on a fabulous year with your blog! I always love seeing your beautiful creations! Congratulations. I love visiting your blog. Congrats Kazan! That is awesome! You are so amazingly talented! I just love following your blog! I always look forward to seeing your wondeful creations! So nice of you to do such a FABULOUS RAK too! Congratulations to you! You are such an amazing talent and an inspiration to so many -- thank you!!! Wow what great blog candy! Well, Happy Birthday to your blog AND your brother! GREAT RAK! Hope I'm the winner! On another note.....you ROCK Kazan! I enjoy your blog everytime I visit. Here's to another great year! That is so awesome, and I know that RAK wants to come to South Africa. No need to enter me in for the RAK...I have pretty much all of that! Hee hee! I just wanted to tell you that card is gorgeous, and congrats on your year of blogging! Congrats on making your 1 year blogoversary! I look forward to many more years to come. Happy blog birthday! That is a beautiful card! Congrats! Make year two be equally as much fun! :) Thanks for the chance to win. Congrats on your anniversary!! Keeping up a blog is alot of work, but you manage to do it and create amazing projest to share with us also. Thank you for all your time and creativity!! Happy Blogoversary! Kazan, your blog is so inspiring, and I LOVE your work on 2S4Y! Happy birthday or in Irish Breithlá shona duit! What a nice Rak very generous of you! love the card. Awesome blog candy! Congrats on the one year! Congratulations on your one year! You started your blog on my birthday, Im just 39 years older then your blog lol~! Scarey. I love you work and I love love love seeing what you create. congrats on your first year! i love seeing your creations and playing with your sketches! Congratulation with your one year of blogging! Great RAK you're offering too! CONGRATULATIONS Kazan!!! Has it been a year already...WOW!!! 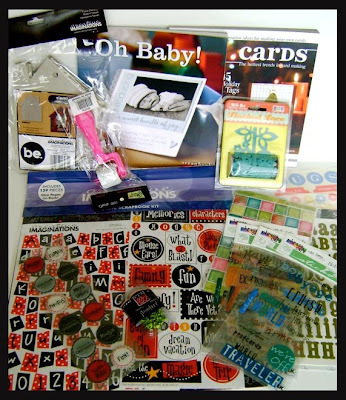 You have a sweet bundle of goodies there!!! I've missed visiting you for several days and am finally getting caught up....love your stuff girlie!!! HUGS!!! Congrats on the 1 year Blogoversary Kazan, here's to many more creative years. Congratulations on 1 year Kazan! It is absolutely amazing what you have accomplished in such a short time! I can't wait to see what in store in the year to come. Woohooo! Congrats on your blogoversary! Love your blog! THANK you for all the inspiration you've shared throughout the year! Oh my goodness - your B*Day card is BEAUTIFUL. 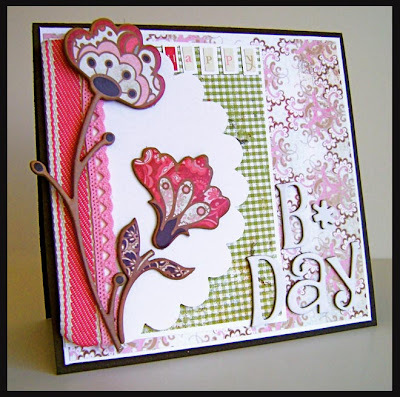 I enjoy card making too and thought I was pretty good until I saw this - wow! Congratulations! I follow your blog and love the 2s4y blog as well. Your talent astounds me. Thanks so much for the chance to celebrate your blogversary with you. Your card is gorgeous! Happy Anniversary! Be sure that I'll "stalk" you again in your second blogging year! Congrats on one year!!! Yeah! Lots of awesome goodies too!!! Hi Kazan, Happy blogoversary. I like your blog, easy to read, great project and I like family pictures thrown in. Great blog candy too. Well congrats on your one year mine has still to come. And hope you'll another one, two three well dozend. Your blog is so full inspiration love it. "Veels geluk" on your 1st anniversary. Your blog is awesome! Congrats, Kazan! Your blog is wonderful. I can't believe I have been checking it almost every day for a year!!!! Here's to many more blogoversaries! Love your card, it's fabulous!!!! Congratulations on your first year!!! How very exciting! Happy first blogoversary! I really enjoy reading your blog! this card is simply stunning !! congrats on your 1 year anniversary !!! your creations are awesome !!! I love stopping by your blog. You are such an inspiration! Happy Blogoversary!!!!!! Congrats on the one year! Your cards are truly beautiful!! I just started reading your blog and I'm addicted now!! Happy Blogoversary, Kazan! Your card is as amzazing as you are!! Happy Birthday & Congratulations on your 1 year! Your girls are beautiful and your creations are extraordinary! Congratulations on your first year of sharing your talents. I wish you many more! Congratulations on 1 year!! I always enjoying coming here and seeing your inspiring work! Congrats on 1 year. Your blog is wonderful, full of creativity and inspiration. Thanks for the chance to win this wonderful blog candy. Happy, happy blogoversary! Yours is one of my absolute favourites...you are an inspiration! Congrats on your 1st Blogoversary! Your blog is full of inspirations. I love all your amazing creations, and thank you for sharing! Congratulations, I love your blog and have probably been here for most of that year. Here's to many, many more!!! A HUGE CONGRATULATIONS KAZAN! Your blogs are one the most inspirational I've come across and your cards are always stunning - Looking forward to another year of fabulous work! I am a scrap beginner and i am looking a lot on the net for some insiration! Well on your blog i can find it. Oh, I can't wait for this drawing! This RAK is awesome!! Also, your newest cards are FAB! Congratulations on one year of blogging!! Your blog is absolutely inspiring!! Congrats on your 1 year!! Wishing you many more amazing projects & posts to come!! Thanks for sharing all your beautiful designs! I love your blog and visit here often! You make such amazing cards! Congrats!!! Thanks so much for all the inspiration and can't wait to see what year 2 brings!! Congrats on 1 year - I look forward to seeing all you come up with over the next year!